Written by Erick Razo On February 8, 2018. Can you believe that February is here already?! This month we celebrate the most powerful of all feelings, love. We express this love through gifts such as roses, chocolates, teddy bears, a candle light dinner and sometimes a nice bottle of wine. In the gemological world, there is a stone that is highly associated with love and ironically is also associated with wine. This month we will talk about Amethyst. 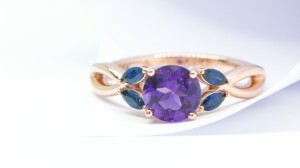 When you think of a purple gemstone, most likely you said “Oh! 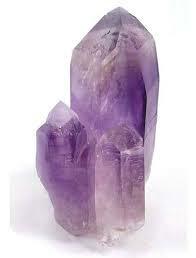 Amethyst.” In that case you would be correct, it is the most commonly associated with the color purple. The ancient Greeks believed Amethyst was closely related to Bacchus, the god of wine due to its colors. Which is why it obtained its name from the greek word Amethystos, which means “not drunk” or a “remedy against drunkenness.” They believed the gemstone had the power to prevent drunkenness, because of that many Amethyst chalices were created. It was also believed that if you wore an Amethyst, you would have a sharp mind and quick intelligence, especially when it came to business and on the battlefield. 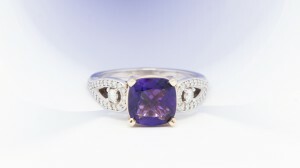 Amethyst had the same value as Ruby, Emerald and Sapphire until the late 1800’s when vasts deposits were found in Brazil. This discovery allowed for the Catholic church to create many rings for their bishops. These rings would be carved with an insignia of sorts to represent each bishop. 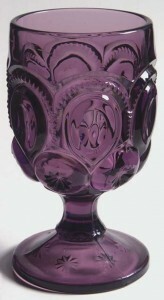 This was really important to them as Amethyst was the emblem of one of the twelve apostles. Many bishop rings continue to be set with Amethyst. St. Valentine, patron of love, wore an Amethyst ring with cupids image carved into it, hence the association of love with Amethyst. 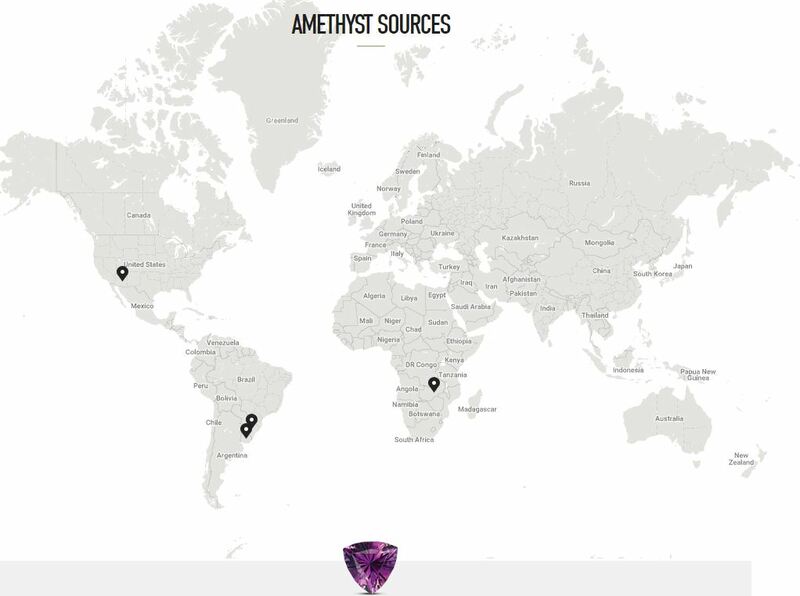 Brazil is the main producer of Amethyst in the world, due to its proximity to Brazil. They can also be found in Uruguay. Amethyst from Zambia is considered to have some of the most beautiful colors for this stone. Arizona in the United States also has an abundance of gem quality Amethyst. Amethyst is the purple color of the quartz mineral species. They grow in large six sided crystals with pyramid like points at the end. They can grow quite large and fetch high prices by collectors. Amethyst is formed by a mixture of silicon and oxygen called silicon dioxide and it presents itself as a mineral in the form of quartz. Amethyst color pallet has a range of cool bluish to reddish purples. They can exhibit some deep, dark purples as well as a light lavender color. Because of its abundance, they can be quite affordable and can be used in rings, bracelets, earrings, pendants and can even be carved into all kinds of shapes. They come in many sizes and shapes, making them great candidates for a lot of jewelry design. Amethyst has a 7 on the Moh’s scale. The Moh’s scale of mineral hardness characterizes the scratch resistance of various minerals on an exponential scale from 10 to 0. The top of the scale is Diamond at 10 and graphite at 0. 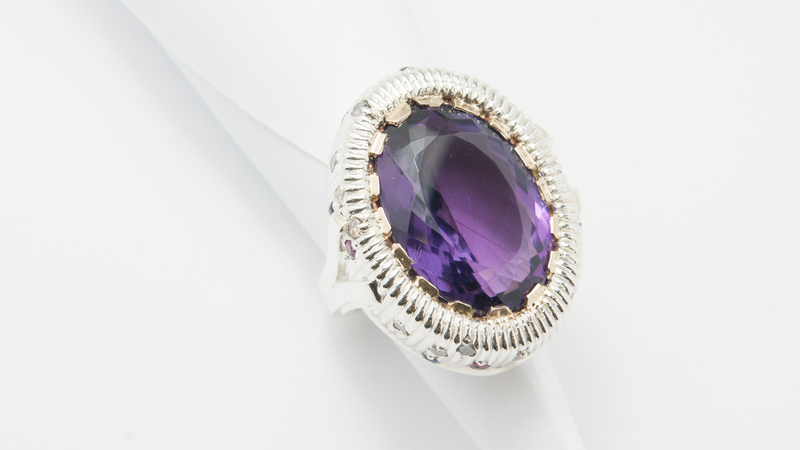 Due to its fair hardness, Amethyst is ideal for jewelry wear, but it should not be subjected to heavy everyday wear. With the right care and the right mounting, you can create a piece that will last for decades. 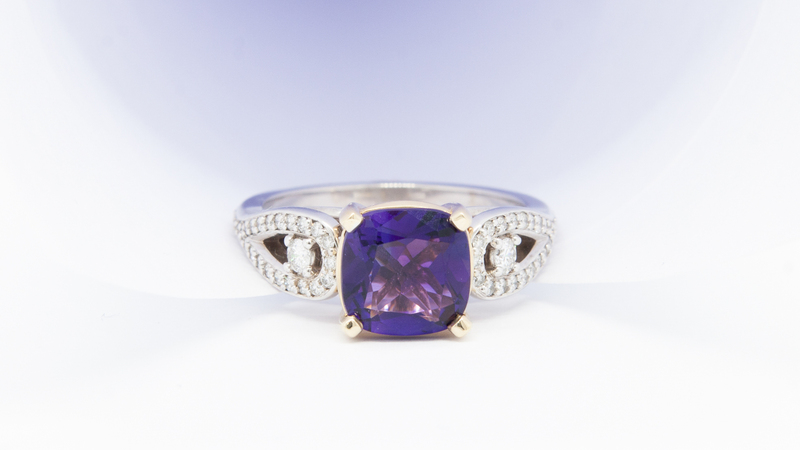 Elegant, simple, and charming are some of the words that can be used to describe the beautiful Amethyst. This month is all about celebrating love, the emotion that overpowers all others. An emotion which makes us smile, makes us feel alive, and helps us find an inner strength that we did not know we had. Express your love to your loved ones whether through words, a nice candle light dinner, a teddy bear, roses, or better yet a beautiful Amethyst jewelry piece. Come in and let us to show you the wonderful world of color. Written by Erick Razo On January 9, 2018. Some of us have the joy of having siblings, and while they can be quite annoying and infuriating, they are also some of our favorite people in the world. For many parents it is fun to see how alike their kids can be, but the most fascinating part is to see how different they are from each other. The gemological world has their own set of siblings that are pretty close to each other, but like all siblings, they differ in more ways than one. We will begin the year looking at Garnet. 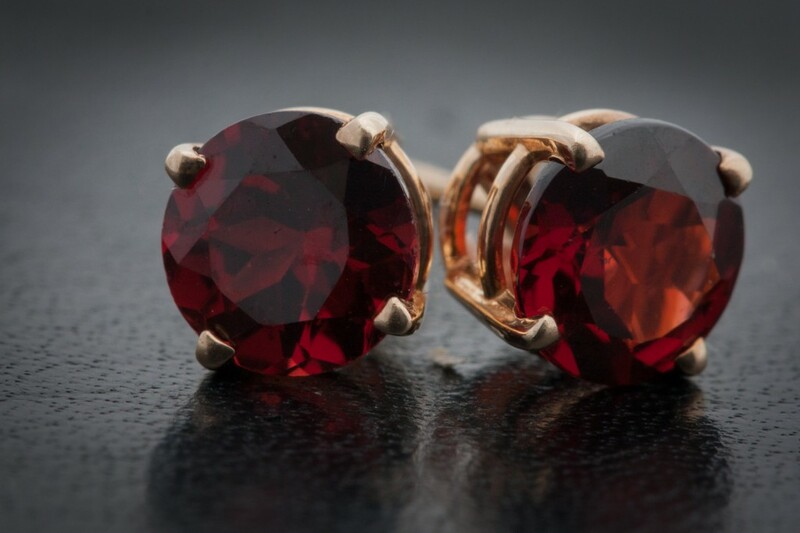 Garnets have been around for centuries, some of the oldest garnets date back to ancient Egyptian civilizations. They symbolize power and passion and because of that they were used to adorn the jewelry of pharaohs. All of that changed when Cleopatra ascended to the throne as Pharaoh of Egypt. 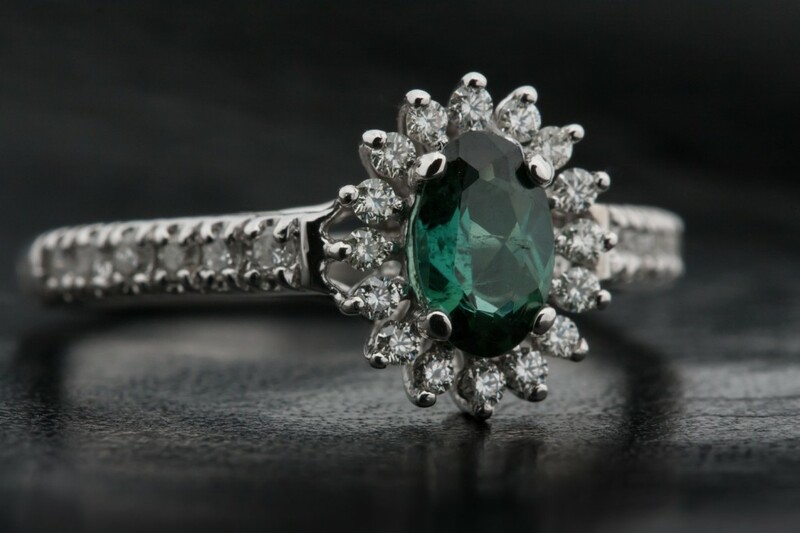 Because of her love for Emeralds, She changed the styles and colors of the jewelry worn at the time (learn more about this in our Emerald blog post (the-wonderful-world-of-color-pt-4/). Garnet obtained its name from the Latin name Malum Granatum, which means “red pomegranate seeds.” Many Roman officials would use their signet rings to stamp official documents, and most of those rings contained carved Garnet crystals, even today you can find Garnet crystals in many signet rings. Then in the Middle Ages, Garnet reached its climax of popularity due to their beautiful red color and abundance. At that time they were worn by clergy and nobility as symbols of power and love. 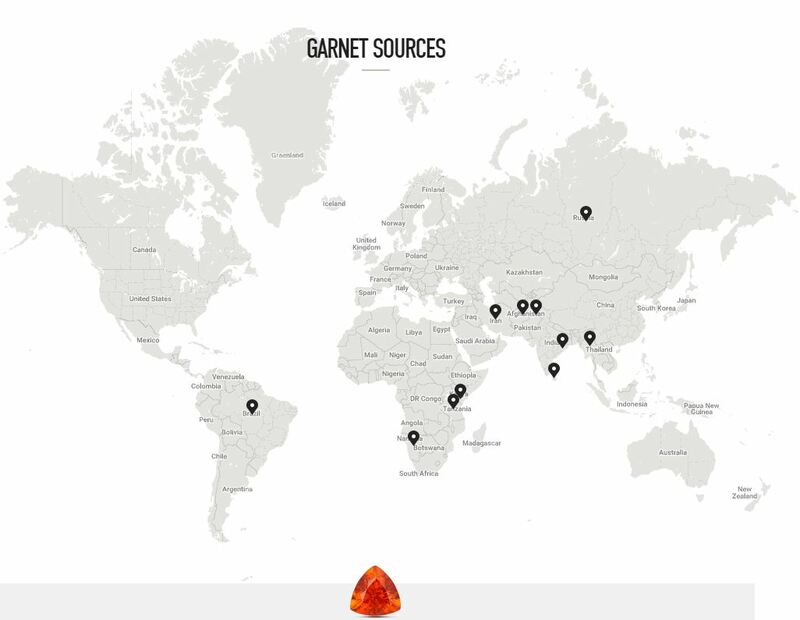 Garnets can be found in Brazil, Russia, Thailand, Kenya and other parts of the Middle East. 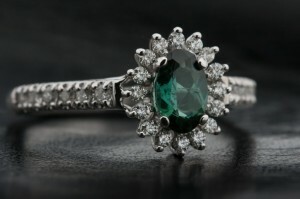 Tsavorite Garnet (known for its beautiful green color) is mined Campbell Bridges. 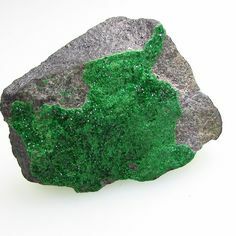 It obtained the name “Tsavorite” because of the proximity to Tsavo National Park in Kenya. Garnets are a set of closely related minerals that form a group. The group is divided into a species, which are classified by what chemical elements compose the Garnet, for example Iron, Chromium, Calcium, Silicon, Aluminum, etc. 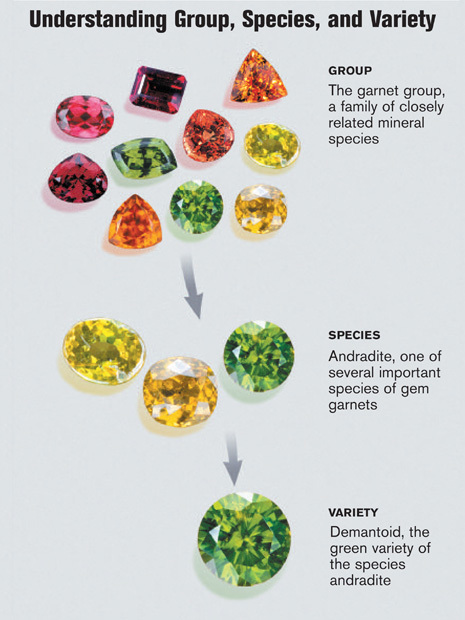 Finally, each garnet gets a variety depending on what species they come from and how they are chemically composed. All Garnets grow in metamorphic rocks, this type of stone is found on every continent and can contain many minerals that can determine how the Garnet forms. They essentially share the same crystal structure, but vary in chemical composition. 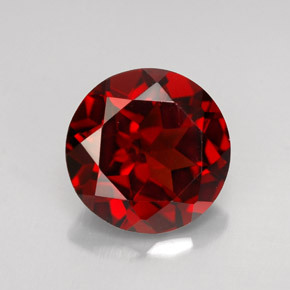 Many Garnets are actually a mixture of two or more other Garnets. 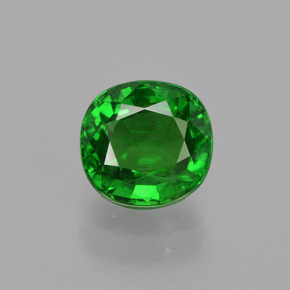 Tsavorite Garnet– This Garnet is known for its intense green color. The primary deposit for this gem is near Kenya. 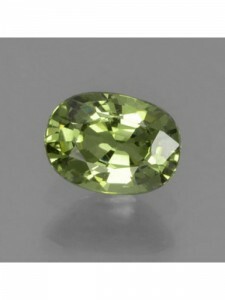 Demantoid Garnet– This Garnet is known for its greenish yellow colors. 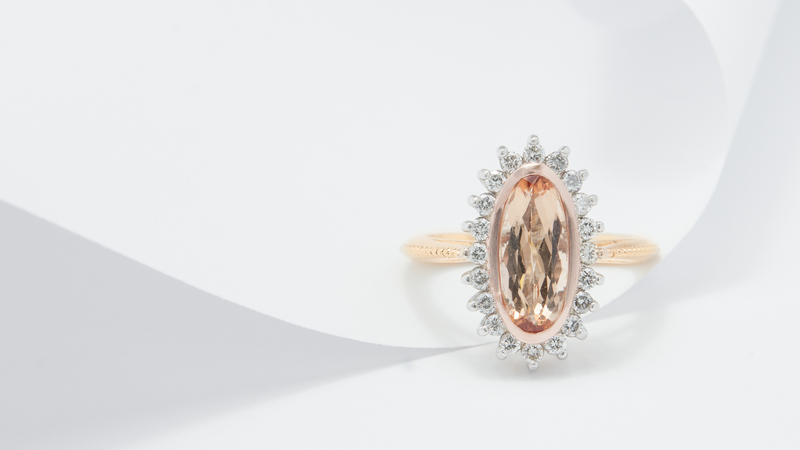 Considered to be the Garnet with the most brilliance. 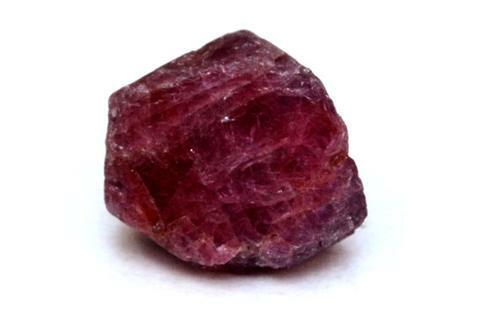 Rhodolite Garnet – Known for its purplish red color, it is a combination of Almandine and Pyrope Garnets. 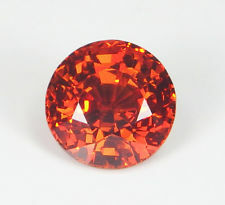 Spessartine Garnet – This Garnet is known for its orange to yellow colors. 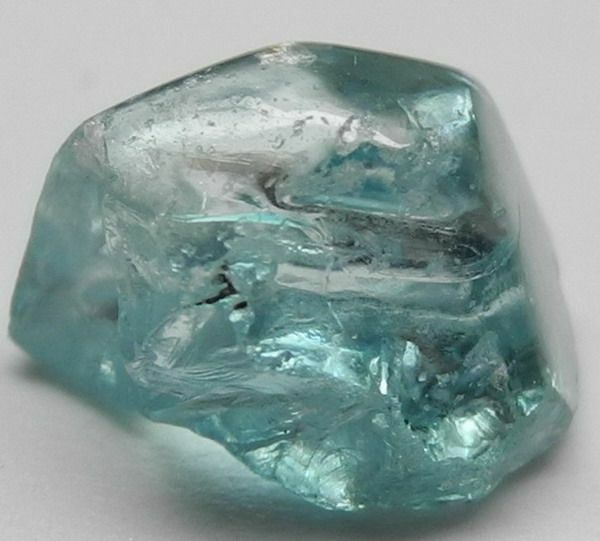 It was not seen in jewelry until the late 1990’s when deposits of it were discovered in Namibia and Mozambique. 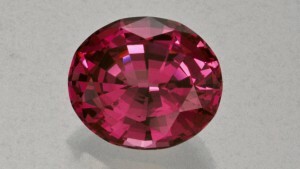 Almandine Garnet – Known for its red color, is one of the most common varieties of garnets. 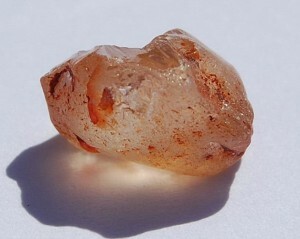 This type of Garnet is also used in the industrial sector as an abrasive. 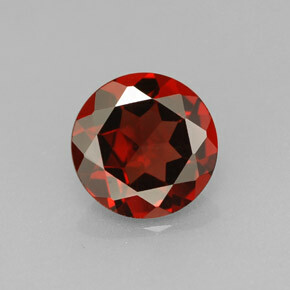 Pyrope Garnet – This is the most common variety of Garnet and is known for its intense, beautiful red color. Because of its rich red color, many thought that they were Rubies for a long time. Uvarovite Garnet – This Garnet has a green color that strikes as Emerald, but the crystals tend to be too small for jewelry use. They are often sought after by collectors. As we have learned, Garnets actually have a large color palette that includes red, green, orange, pinkish, pinkish orange, purplish red and rarely some blue. This allows jewelers and designers to create astonishing and breathtaking pieces of jewelry. Earrings, rings, bracelets, and pendants can be fashioned with the exquisite color palette of Garnet. Garnet ranks 6.5-7.5 on the Moh’s scale. The Moh’s scale of mineral hardness characterizes the scratch resistance of various minerals on an exponential scale from 10 to 0. At the top of the scale is Diamond ranking at 10 and Graphite at 0. Due to its excellent hardness, Garnet is ideal for everyday wear. 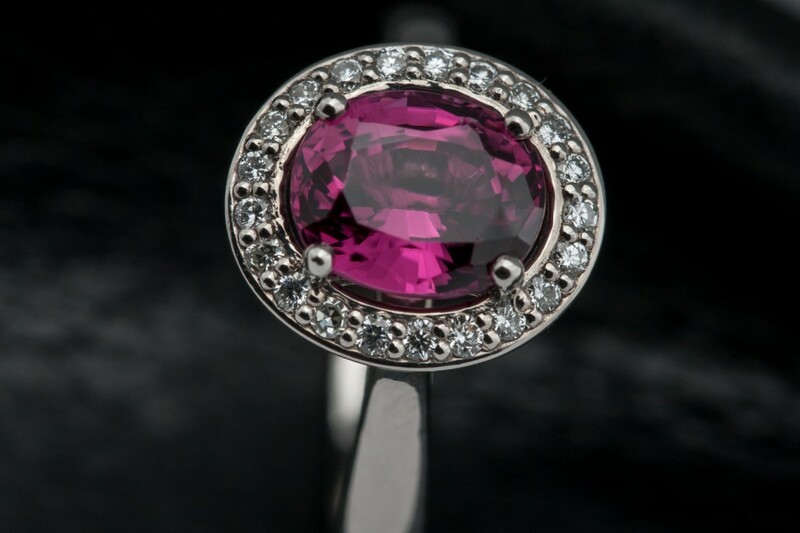 In the right mounting with the proper protection, Garnet will last a long time. Garnets are a big family, each one having their different colors and properties that differentiate them from each other. Just like a family, each member has a different personality and way of expressing themselves, but we all share one thing–the love we have for each other. 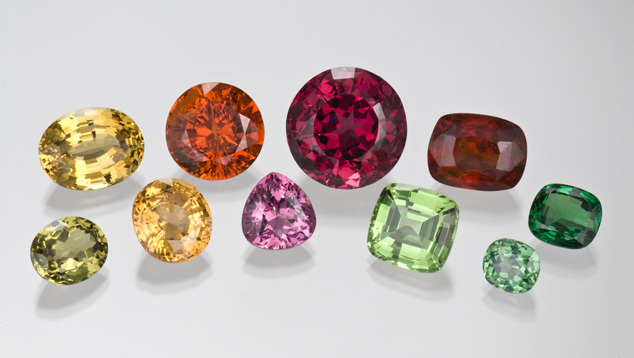 This January, come by and look at all the different colors that Garnet has to offer. Written by Erick Razo On December 6, 2017. The atmosphere is getting colder, but our hearts are getting warmer. The sounds of holiday music is everywhere, the smell of our favorite hot drinks and of course the sights of all the beautiful color lights that adorn our homes and streets. 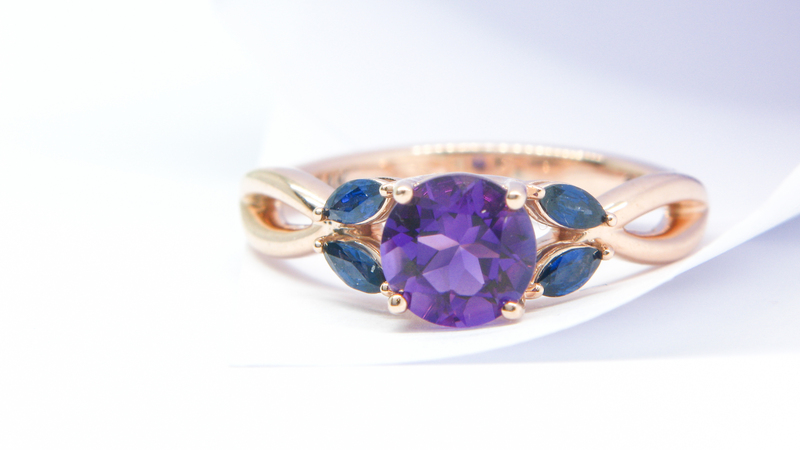 In the gemological world December gives us a stone that can match much of the seasons color palette. From the decorations to snow covered fields. This month we will look at Zircon. 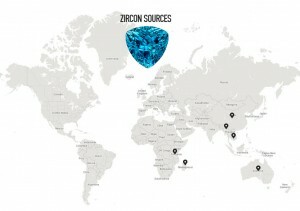 There are two theories as to how zircon obtained its name. 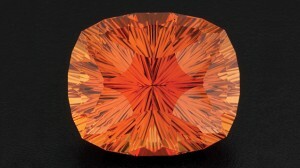 One of the theories suggests that it came from the Arabic word Zarkun which means “cinnabar” or “vermilion.” The second theory suggests it derived from the Persian word Zargun or “gold colored.” Some of the colors that Zircon offers can match those descriptive words, making both theories believable. 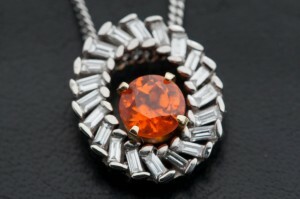 Colorless Zircon is known for its outstanding brilliance and flashes of multicolored light, called fire. This stone is so similar to Diamond when viewed with the unaided eye, that it has bred a common confusion between the two gems for centuries. The consequence of this confusion has led many people to think of Zircon as an only a diamond imitation, but fail to realize the beauty and special characteristics of this beautiful stone. During the Middle Ages, Zircon was thought to induce sleep. Drive away evil spirits and promote riches, honor and wisdom. 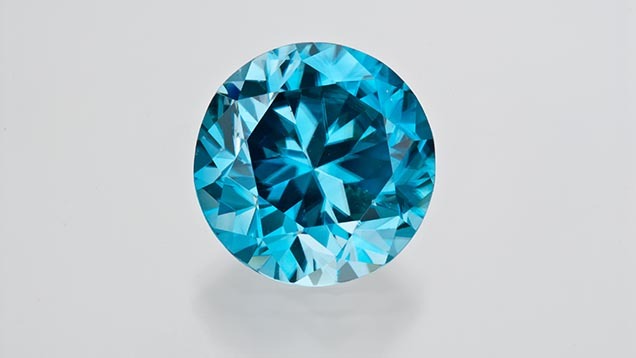 Blue Zircon however obtained huge popularity during the Victorian Era (1837-1901) thanks to its delightful color and great amount of brilliance, it was worn in almost all colored stone jewelry of the time. Gemologist George Kuntz -Tiffany’s famed gem buyer and discoverer of Kunzite- was an advocate of Zircon. He proposed the name “starlite” for Zircon to make people aware of the stones unique optical properties, but it never caught on. Zircon can be found in places like Madagascar, Australia, China, Sri Lanka and Tanzania. They are found in a range of colors. 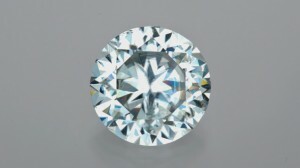 Matara Zircon is name given to colorless Zircon that is mined from the city with the same name near Sri Lanka near where it is mined. The chemical compound of Zirconium and Silicate (a compound of silicon and other minerals) create Zirconium silicate which in nature occurs as Zircon. It is usually colorless, but impurities in the crystal structure can cause different colorations. Zircon crystals can grow in many different type of host rocks, because of this they posses a range of optical and physical properties. Some Zircons can have radioactive trace elements like Uranium. This radioactive trace elements can cause a process called metamictization, which is a natural process resulting in the gradual (and eventually complete) destruction of a mineral’s crystal structure. 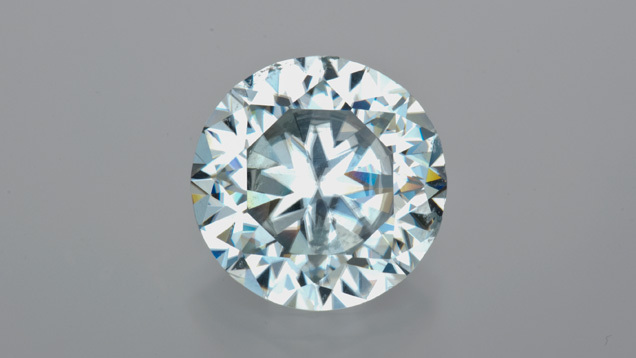 This causes the Zircon to irradiate itself and change its properties both optical and physical.Zircons are classified into three different types: High, intermediate, and low. They receive a classification depending on their properties, which are directly related to the amount of damage the radioactive trace elements have done to the crystal structure. 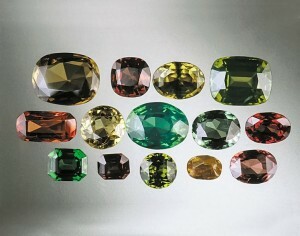 Zircon comes in many colors such as brown, blue, green, yellow, red, pink, reddish and colorless. 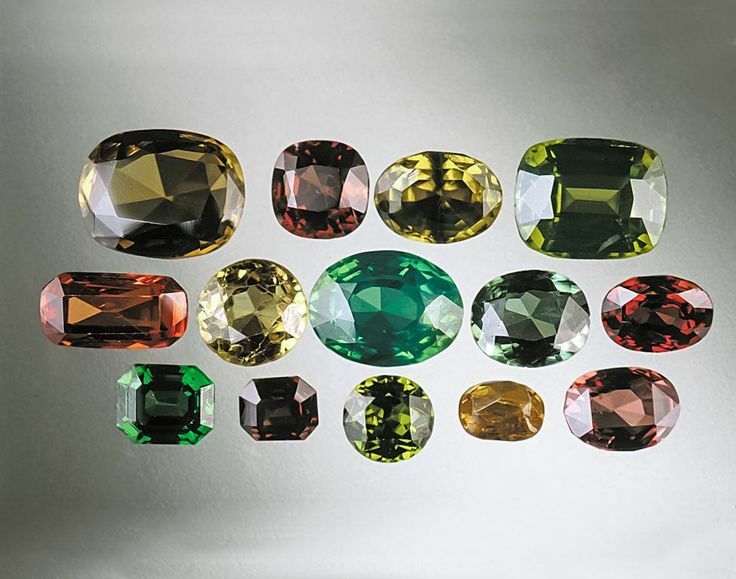 Zircon colors are so variant and beautiful that allows jewelery designers to create one-of-a-kind pieces, but it is also a stone that is sought after by collectors due to its unique colors. 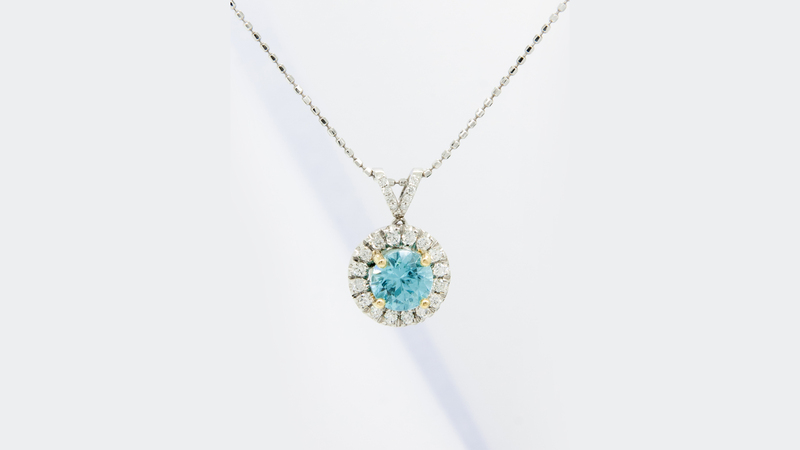 Necklaces, pendants, rings, bracelets, and earrings are adorned by Zircon. Zircon has an 6- 7.5 on the Moh’s scale. The Moh’s scale of mineral hardness characterizes the scratch resistance of various minerals on an exponential scale from 10 to 0. The top of the scale is Diamond at 10 and graphite at 0. 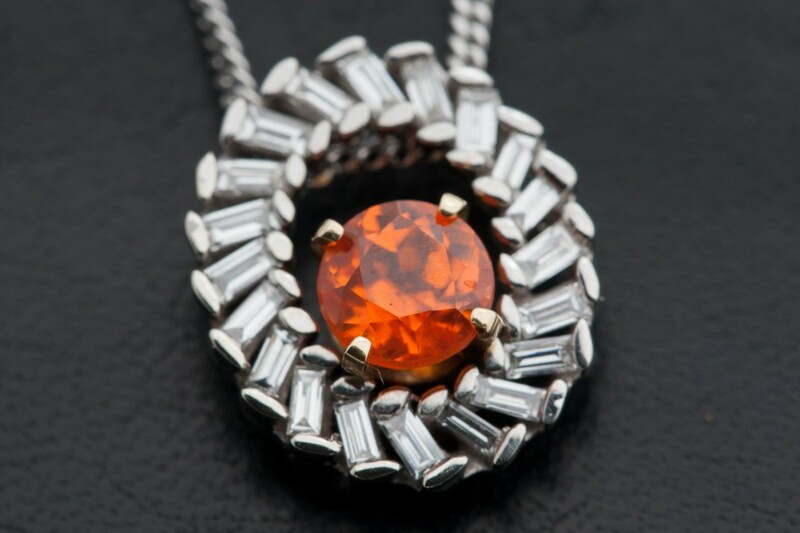 Due to its good hardness, Zircon is ideal for occasional wear, due to its brittle nature. In the right mounting with the proper protection, Zircon will last a long time. 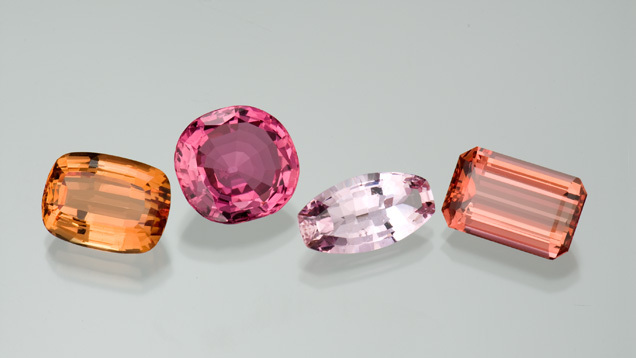 Just like each family has their own special traditions, languages, memories, and foods making them one of a kind, the many different colors and interesting optical properties of Zircon make it stand out from all others. Getting together with those loved ones makes this the most wonderful time of the year. From all of us here at Diadem Jewelers we wish you a Merry Christmas and a Happy New Year! Learn about many of the other amazing areas of the Wonderful World of Color by clicking the link below! Written by Micah Brown On November 21, 2017. 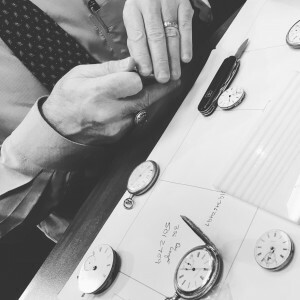 It’s no secret that we are one of the few places in the triad, maybe even the state, where you can receive high quality watch repair. We service just about any watch from basic Walmart to sophisticated Swiss and everything in between, especially pocket watches. Believe it or not, prior to the 1900’s America was a premiere watch manufacturer. Bringing us some of the most prolific brands in pocket watches. Names like Elgin, Waltham, and Illinois all were hugely successful during this era, producing what would become millions of watches for the American public. Sadly, this era of fine craftsmanship that produced not just a time piece but a moving work of art is all but dead. The advent of the smaller movement that could fit on the wrist and eventually the breakthrough of battery powered watches was pretty much the nail in the coffin for pocket watches. However, every generation after that has still had an affinity for these meticulously hand crafted little machines. It was their great great grandfathers, passed down from father to son for generations. Some live in drawers with broken gears and missing crystals, the lucky ones still tick but can’t keep time. The sentiment they carry of lost loved ones is there but it’s out of site and out of mind. Often they are sadly relegated to those few individuals who enjoy tinkering or collecting them like trading cards or art. The demand for larger watches coupled with the desire for total individuality is at an all time high. Concurrently, the modern individual is seeking something unique yet bespoke. From their coffee shops to to their shoes, they want quality. They want not just quality in a piece but seek to understand provenance in what they buy. We are brining the bygone into a new era. The watch pictured above is a Waltham. 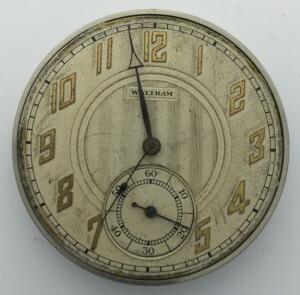 The American Waltham Watch Company began making fine watches in 1850. The company was founded by David Davis, Aaron Dennison, and Edward Howard. Their vision was to form a watch company that could produce high-quality watches at a lower cost using interchangeable parts. In 1860, as Abraham Lincoln was elected President and the country found itself amidst the Civil War, the American Watch Company was faced with serious financial problems. Lincoln carried the whole nation, and a Waltham pocket watch, with him through one of the darkest chapters of our history. Alongside our nation, the company barely survived the war but was able to rebuild, restructure, and reinvigorate the economy. Waltham continued to manufacture watches until 1957. The watch pictured above, and all the history it represents, is going to be made into a new American venture. By utilizing cutting edge manufacturing processes including 3D printing and laser engraving, united with care and attention to detail that can only come from a hand assembly, this watch will be given a place where it is never out of sight or out of mind. It will go on your wrist. Choose from our carefully curated selection of American made pocket watches that have been completely updated and overhauled, ready to keep you on time in a way no other watch can. Or, take your own beloved pocket watch and give it a new lease on life. 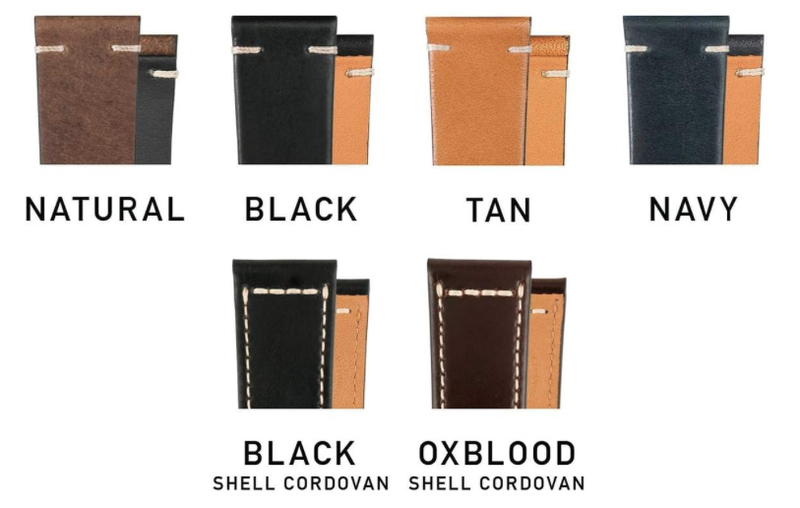 Above is shown a just a couple of the hundreds of possible combinations for cases, crowns, and straps that are available in order to make your watch as unique as you are. Currently we can only convert certain watch brands and sizes but there are plans to include more options in the future. The front and rear crystal (showcasing the gorgeous inner workings) on each watch are made from Corning Gorilla Glass. Each crystal is precision cut by Abrisa in Santa Paula, CA. Gorilla Glass is known for superior clarity, resistance to shattering, and scratch resistance. Choose from four totally diverse titanium case colors. Each water-resistant case is 3D printed in titanium by Imperial Machine and Tool in New Jersey. This company specializes in advanced machining practices for the aerospace and military industries. 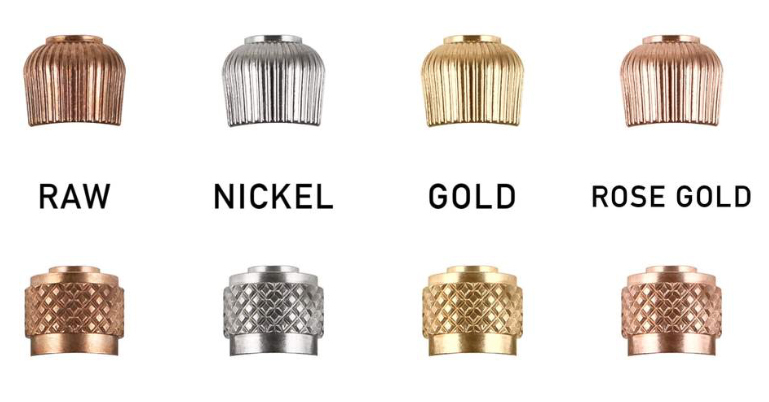 Choose from eight different crowns as the perfect accent. From Raw Copper, Nickel or yellow or rose Gold plated. The crowns, screws and other internal parts of each watch are masterfully machined at Swiss-O-Matic in Montrose, CO. Running a swiss-turning machine takes a great deal of precision and specialized skill, and we are fortunate to partner with one of the top facilities in the United States. Choose from four American cowhide leather bands from Hadley Roma’s Stylecraft division in Largo, FL. or two premium, Famous Horween Shell Cordovan horsehide leather straps from Chicago, IL. Each buckle is hand-forged by Smith Shop in Detroit, MI. For the final element of total tailoring that goes into each handcrafted masterpiece, several areas on the watch are available for laser engraving to emblazon personal messages, images or designs. These watches are undeniably one of the most unique timepieces in the country. Written by Erick Razo On November 2, 2017. The attic is calling you to grab your favorite sweater because the cold winds of fall have arrived. Bonfires become a mainstay as we gather with our friends, roast marshmallows and laugh at the stories we share. In the gemological world, November gives us a stone that comes in all the colors of fall. Cool blue hues like the cold winds and vibrant reds and oranges like the colors of the bonfires that we love so much. 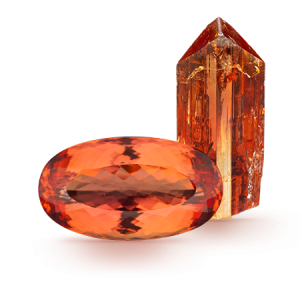 This month we will take a look at Topaz. 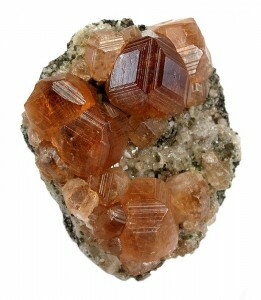 There are two theories as to how topaz obtained its name. Many believe it came from the old Greek name of a small island located in the Red Sea, called Topazios. The island is now called Zabargad, and it has never been a source of topaz, but it once became a known source for peridot. The ancient Greeks used to wear topaz as they believed it would grant them strength. The second theory is that it comes from an old Indian language called Sanskrit. 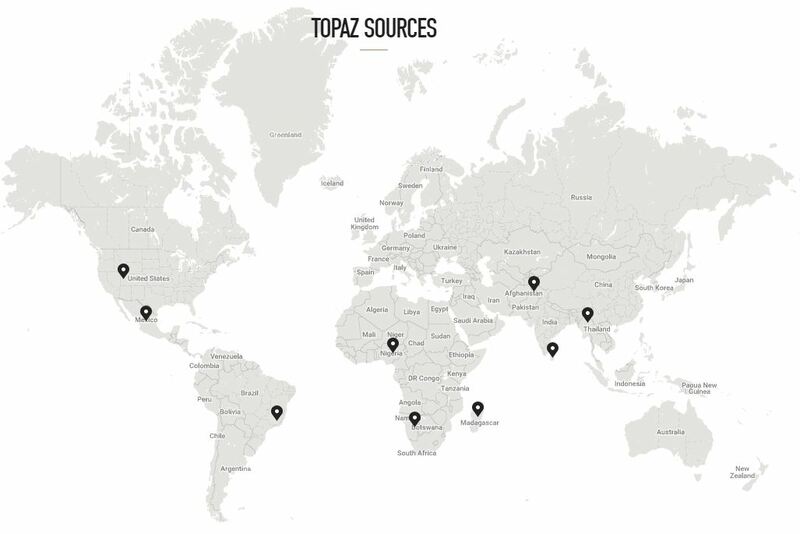 Topaz got its name from the word topas or tapaz, which means fire. For centuries many people in India believed that wearing topaz above the heart assured them a long life, beauty, and intelligence. Which one is correct? Well, we may never know. 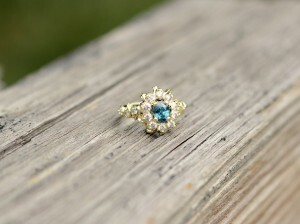 Topaz acquired a lot of favoritism as a stone of choice for jewelry during the Renaissance period in Europe, as they believed it had the power to dispel anger and block magic spells. During the 19th century, in the Ural Mountains Imperial topaz was discovered (more on this later.) 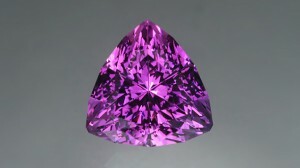 It obtained the name Imperial topaz as it was named to honor the Czar of Russia. Only those of the royal family were allowed to wear the pinkish-orange stone. Topaz can be found all around the world ranging from light to dark hues of multiple colors, but Brazil is the only country with a known deposit of Imperial Topaz. 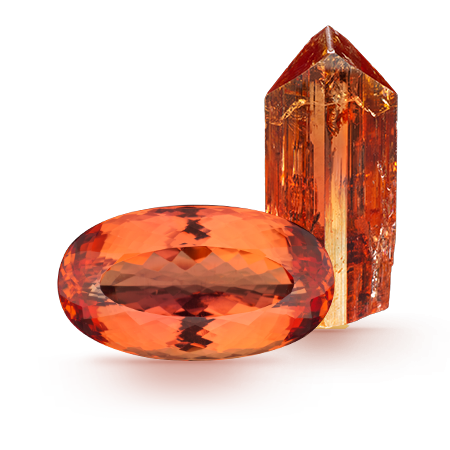 Imperial Topaz is a medium reddish orange to orange-red color; this is the most valuable of all topaz colors. Topaz is an aluminum silicate-containing fluorine. The topaz crystal begins to form, thanks to the fluorine-bearing vapors are given off during the last stages of crystallization of igneous rocks. Topaz is an allochromatic stone; this means that the color topaz obtains from impurity elements or defects in its crystal structure. 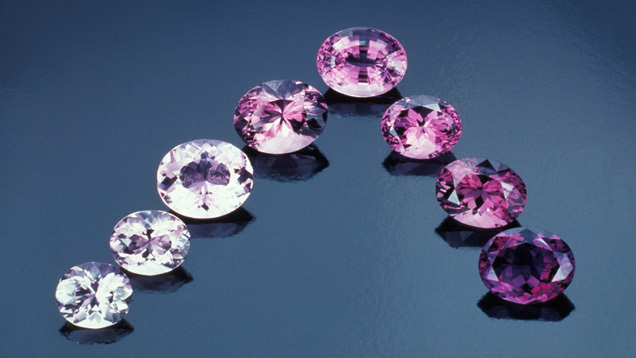 Unlike most other gemstones that gain their color from their basic chemical composition. 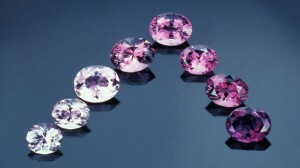 An example would be how the trace element chromium produces natural pink, red and violet colors in topaz. Imperfections at the atomic level cause the color to change into a yellow, brown and blue colors. 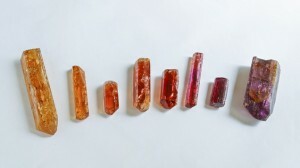 Topaz grows in an elongated fashion, with grooves parallel to their lengths. 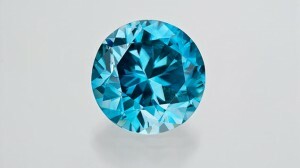 To take advantage of their growth, oval and pears are the predominant shapes of topaz finalized gems. 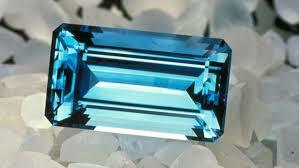 Topaz comes in many colors such as brown, blue, green, yellow, orange, red, pink, purple and colorless. Topaz colors get their names based on the hue they display, and jewelry designers love the pieces they can create with the many colors and shapes topaz offers. 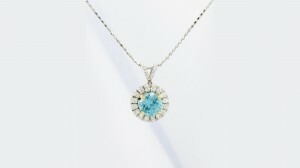 Necklaces, pendants, rings, bracelets, and earrings are adorned by topaz. Topaz has an 8-8.5 on the Moh’s scale. The Moh’s scale of mineral hardness characterizes the scratch resistance of various minerals on an exponential scale from 10 to 0. The top of the scale is Diamond at 10 and graphite at 0. Due to its good hardness, Topaz is ideal for everyday wear, in the right mounting with the proper protection, Topaz will last a long time. Thanksgiving is one of the best holidays in the year. People travel from all over the world to gather together and share memories that are never forgotten. That feeling of seeing your loved ones gathered around the table to share a meal and tell the stories of their crazy year so far. The color of warmth, the color of comfort, the color of love, the color of adventure, and the color of laughter. All of those colors are part of the many beautiful hues and tones that Topaz offers, would you like to see them up close? Come see us this November and let us show you the wonderful world of color.